If you have suffered from acid reflux, you will fully acknowledge the challenges and problems that this disease poses to your day-to-day life. This is especially true, if acid reflux haunts childhood with its numerous associated ailments. Acid reflux in kids is not just about aches and pains. It can affect the child seriously in more ways than one. Hence, parents should take into consideration the numerous problems and challenges of acid reflux in kids, to help their children deal with it in the best possible way. Acid reflux is a type of disorder that affects many people all over the world. The body follows a delicate procedure of digesting the food. Because of acid reflux, the gastric juices, which contain essential acids, reflux from the stomach to the esophagus. Thus, a person suffering from acid reflux may experience burning sensation in his chest sometimes accompanied with a strange constricting pain, nausea and a general sense of discomfort. Though not deadly if untreated, this disease can pose many serious health complications. It is also a distressing disorder in kids as it can easily affect the child because of their delicate digestive system and the overall constitution of the children which makes them more vulnerable to the unbearable symptoms. · Physical problems: The symptoms of acid reflux are more or less the same for kids as they are for adults. However, the delicate constitution of kids, coupled with their sensitivity, can make the symptoms seem more intense. Also, the tolerance level of kids plays a major role in how well the symptoms are handled. · Frequent spitting or vomiting, refusing food or eating only small quantities, irritability, constant crying, frequent hiccups pr coughing, poor sleep habits, bad breath, difficulty in swallowing due to frequent sore throat, respiratory problems and sometimes spells of paused breathing, excessive drooling, etc. are the common symptoms. · Problems of medication: Acid reflux prescription drugs can have many side effects; besides, some forms of drugs are off-limits for children as young as six years old. Hence, mostly, mild liquid suspensions can only be used for controlling acid reflux in kids. Even then, many children, who have prolonged acid reflux, fall prey to the side effects of these prescription drugs. 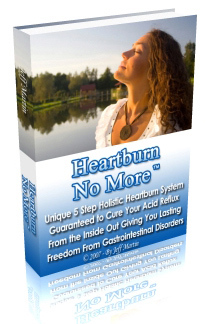 · Problem of diet: Acid reflux requires an individual to adhere to strict diet. However, kids are not able to understand the importance of this type of diet and may throw tantrum when they are denied their favourite food item. Hence, adhering to the diet may be a problem. Conventional medicine may fail to address all this issues, as it main tries to alleviate the symptoms without addressing the core problem. It also inflicts a host of side effects including damages to nervous system, digestive disorders of more complicated nature, and renal failure. However, alternate medicine therapies do provide a solution to the core problem as well as all the peripheral problems of associated symptoms.. In particular, the holistic approach provides complete guidance to the parents.. Right from helping the parents to decide the diet of their children, to providing healing emotional support, holistic approach has managed to address the issue comprehensively. Also, holistic approach can eliminate the root cause of acid reflux, ensuring that your child does not fall prey to either the symptoms or the disorder. This capability of holistic approach endears it to anxious parents and guardians who can finally hope to see their kids enjoying their childhood without the shackles of acid reflux.